In the original storyline, K-9 summons the Doctor to investigate time experiments in an evacuated London. Here they find the Monks working for an alien are taking advantage of a time experiment that conducted in the past and resulted in a 'time scar' running through the same point in space through all time. In a later draft, the Monks were replaced by the Krillitanes. When the TARDIS is stolen, the Doctor and K-9 must ride the time scar to find it. They first go to the future (facing Ood), then to the past (Empty Child). In another episode, whoever has stolen the TARDIS sends two Clockwork Robots to kill the Doctor. The Doctor destroys one and is attacked by the other but suddenly their employers realise that the Doctor (not just his TARDIS) is vital to their plan and must be spared. They are the Daleks. The first part of a longer story initially intended to involve many of the figures released early in 2007. A later draft of the story added Martha but she is left behind as the Doctor rides the time scar alone. The appearance of the Master in series 3 opened up the possibility of including that character, providing the story with a new villain. Setting it after Utopia negated the need for the TARDIS to be stolen- the Master already has it. 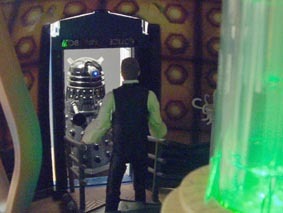 Suddenly the Clockwork Men were superfluous, their role taken by the Assault Dalek and its 'time displacement' weapon. The other inspiration for this story had been Dalek Sec himself. It was a fascinating concept- a monstrous looking human Dalek. In Evolution of the Daleks, it was kind of inevitable that the humanity side would take over but before that happened it would have been nice if he could have explored his capacity for evil a bit more first. The combination of the evil Sec and the insane Master will (hopefully) be an interesting concept. Shooting began on 30 November with the Master/ TARDIS interior scenes, followed by the appearance of the Doctor, Jack and Martha in the alley. The set and bins are intended to recreate the same scene in The Sound of Drums. 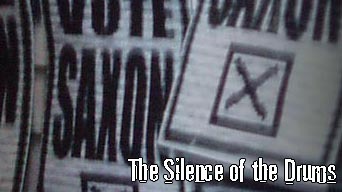 As time is changed, the Vote Saxon posters disappear replaced by Combat 3000 posters from the Sarah Jane episode Warriors of Kudlak. The remainder of the episode, the Dalek attack, the Doctor's capture and the reveal of the new Hybrid were shot on 5 January 08. The shot of the Master at the TARDIS door was a late pick up on 8th January. The original story was called The London Game- in reference to the time scar fixed in the same point in space. This episode was called Tempus Interruptus in reference to the fact that someone has altered time. 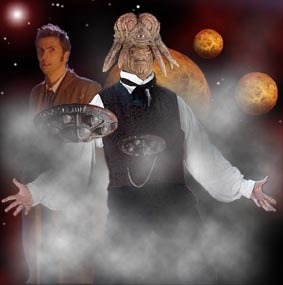 The original opening scene featured the Face of Boe and has been moved to a later episode. This opening scene as shot ended with the Master opening the TARDIS door to be faced with Dalek Sec but as editing on the story progressed it was decided that the Dalek involvement should be revealed in stages. Editing of the flash episode began on 8th January and finished on 18th January.